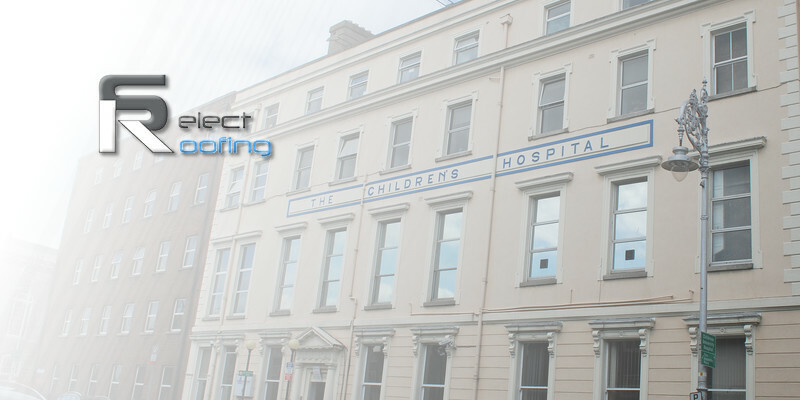 Select Roofing’s work on Temple Street Children’s Hospital was a highly sensitive and delicate project. Due to the fact it was a hospital environment which had to remain “live” throughout the works and the huge disruption which any small mistake may cause to the vulnerable patients of the hospital extreme care and caution was exercised and observed both in the intensive pre-planning of the project and the execution of the work itself. We installed a Paralon bituminous built up system combined with Kingspan rainscreen cladding. A Cable Safe Fall Arrest System was also installed so as to adhere to Health and Safety Regulations and guarantee greater safety during future works.